Find creative ways to include exercise in daily routines. 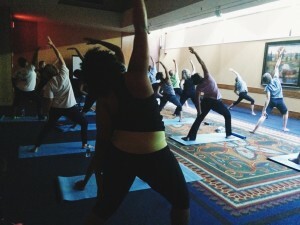 This conference group added a yoga session to help kick their day off with a healthy start! Days at work are often stressful, and being active can reduce some of that stress. Regular activity also keeps your bones strong, improves how your body functions and helps you maintain a healthy weight. People often feel energized after a good workout, so adding some daily activities during the day may actually help you get more work done. Pack a brown bag lunch and walk around the block with a friend or coworker after you eat–you can catch up on news while staying motivated! In your office, take 10 minutes to stretch, run in place or do jumping jacks. After lunch, if the weather is bad, walk quickly up and down the stairs to burn some calories and get your blood pumping. Keep hand weights in your office and take a few minutes a couple days a week to pump out a few reps. When going to work, get off the bus or train one stop early and walk, skate or bike the rest of the way. Replace a coffee break with a brisk, 10-minute walk. Ask a friend to go with you. Go online for some office yoga instruction. Play a good song on your computer or phone, close your office door and dance! Keep comfortable workout clothes in your car or office so you can exercise anytime. Set alarms on your phone to remember to stop for a movement break several times a day. Choose activities that you enjoy and can do regularly. Try to make activities fun, like setting goals for walking a certain amount of steps per week (and don’t forget to have rewards, of course). Alter the activities every couple of weeks to keep things fresh. And remember, any activity is better than no activity. Just keep moving! Posted in Featured. This entry was tagged exercise, health, healthy, managing stress, yoga. Bookmark the permalink.